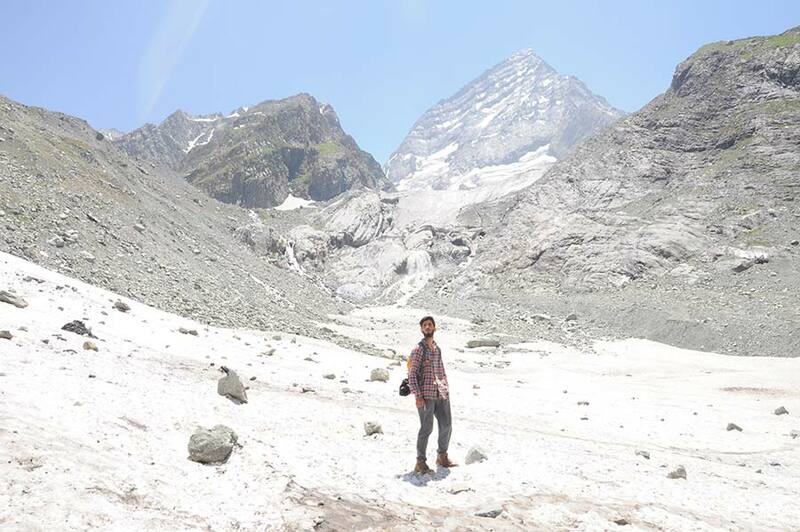 Majid Ahmed, student of a Government Degree College, is a frequent trekker to Kolhai Glacier. In 2010, he went up for the first time. This summer he is on the glacier, for the fourth time. “I see the rapid changes,” Majid said. Accompanied by friends Adil and Suhaib both 23, when Majid reached Satlanjan, the base camp for trekking saw a marked shrinkage.“Last year where we started the ice trek was dry this time.” The shrinkage is physically verifiable, year after year. Majid usually accompanies the trekkers from Jawahar Institute of Mountaineering (JIM), and every year he measures the shrinkage in meters. “Even shepherds or nomads spending nights near the glacier and disturb the environment by lighting up huge fires,” he said. Sajad Ahmed 35, lives in the picturesque Aaru valley and is a frequent visitor to Glacier. 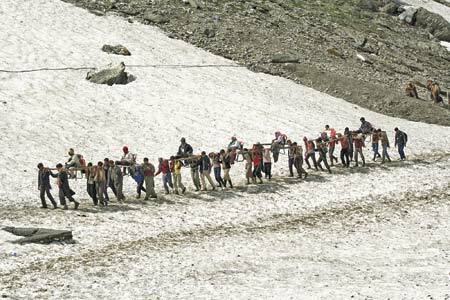 “This glacier is the main source of water and if it disappears, what will happen to Kashmir?” he asks, insisting the people must start thinking. “Are we gradually getting into a desert?” Residents say the glacier extended down the river bed earlier. Now it is kilometers away as the river bed is dry. 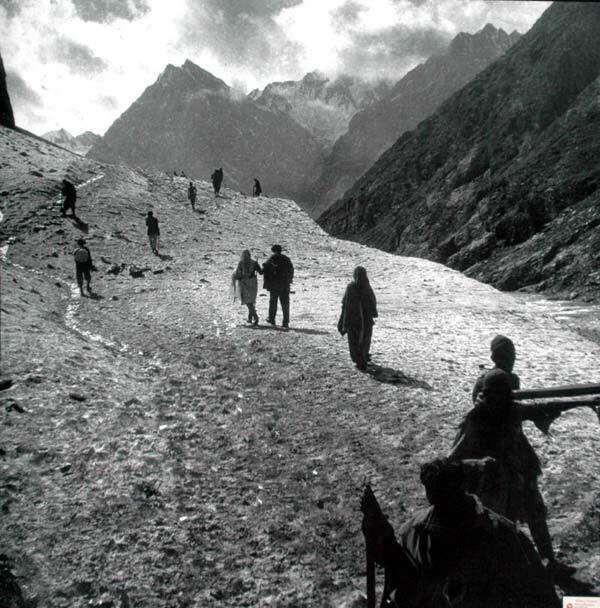 Less glaciated now: An old undated Kashmir picture. Majid and his two friends lack any scientific experience to trek to the accumulation zone, but the trio has played a vital role in collecting data on the lower portions of the glacier known as the ablation zone or the area where the ice melts. The rapid changes in the mass of the glacier have already started impacting the human life around. Located over the peaks between Sonamrag and Pahalgam, Kolhai feeds the Lidder river and contributes its glacial melt to various small streams which eventually join Sindh. It has reduced from 13.57 sq km to in 1963 to 10.69 sq km in 2005. Various accounts suggest that the climatic change induced by clear biotic interventions has hollowed it making it all the more dangerous. Many experts call it a hanging glacier. Kashmir valley’s only year-round source of water, The Economist reported in October 2008, is in “dirty brown colour, wrinkled with crevasses” and “looks more like an enormous mudslide than a frozen reservoir of fresh water”. “Nomads go with their herds near the glacier, light up the fires and the immense smoke not only pollutes but effects on glacier also,” Mushtaq said. “They do not have an option. Why can’t a state government provide them solar lights so that there are no bonfires or smoke near the glacier?” In Ladakh, Mushtaq said, half of the cleaning of the tourist spots is done by residents. Why cannot we do? Dudsar and Hukhsar are the two rivulets flowing on either side of the glacier. A few years back, they were too small but they have grown bigger. “The waterfalls are clearly depicting the crisis of the glacier,” he said.